We’ve designed and installed a striking bespoke reception desk plus new washrooms for an award-winning office development with ISG. The Bower Building at 4 Roundwood Avenue on Stockley Park, provides 151,000 sq. ft. of world class office accommodation, built to uncompromised design standards. The extensive refurbishment of the building, designed by ESA Architects and carried out by ISG, won the Best Refurbishment/Regeneration of the Year award at the OAS Development Awards 2017. The reception area at The Bower had to set the tone for the rest of the building and to make a lasting impression on visitors. 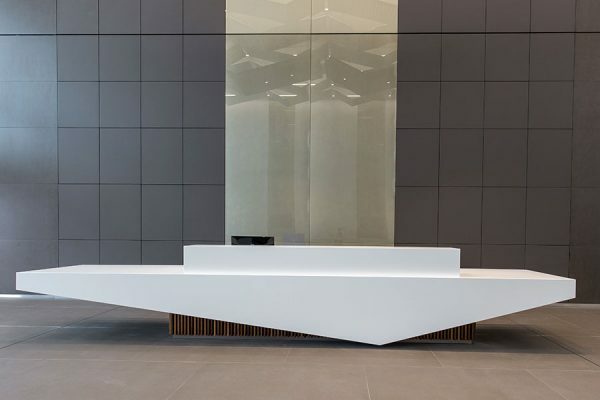 With this in mind, we designed and manufactured a bespoke Corian reception desk to mirror the angular lines of the unique feature staircases in the building’s central atrium. We also installed new male and female washrooms to three levels across four cores of the building. 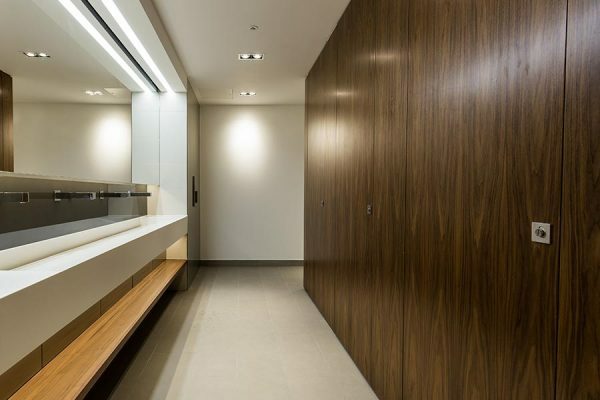 Utilising our exclusive Iconica Collection, the washroom design features real wood veneers, glass and Corian to complement the high specification finish seen throughout the building. The team constructed the vanities off-site and stored them at our Essex factory, ready to be delivered to site just in time for installation. 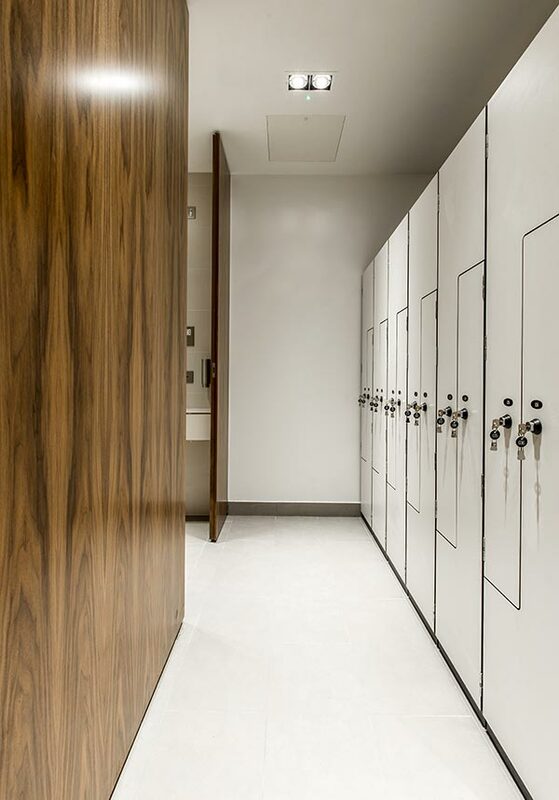 Our full height Alto toilet cubicles were specified with a real wood walnut veneer finish for this project. 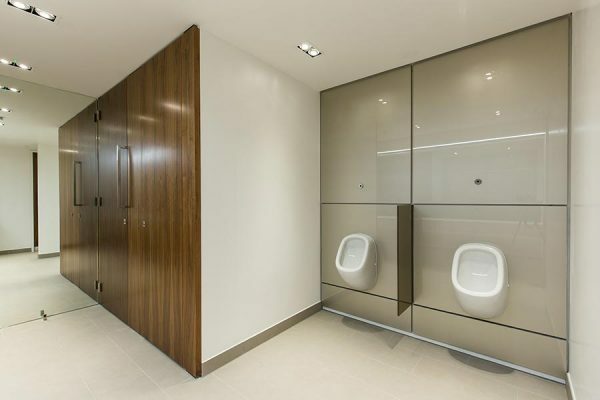 The cubicle’s rebated edge design creates a flush front for a virtually seamless façade, while its full height doors offer complete privacy for end users, making it a popular choice for high specification office washrooms. We designed the bespoke white Corian trough-style vanity units specifically for The Bower. Featuring a slight slope and clean angular lines, the vanity units also include an integral handbag shelf underneath, while back-painted glass splashbacks and wall-mounted taps complete the design. The Tego hinged mirror units above the vanities provide a compact hidden storage solution for essential washroom consumables. Faced with toughened back-painted glass, our Concerto integrated duct panelling system, which we installed behind the WCs and urinals, further adds to the high specification style of the new washrooms. Designed to allow ease of access for any future maintenance, whether planned or reactive, with minimum disruption, the glass duct panels are the perfect balance of form and function. 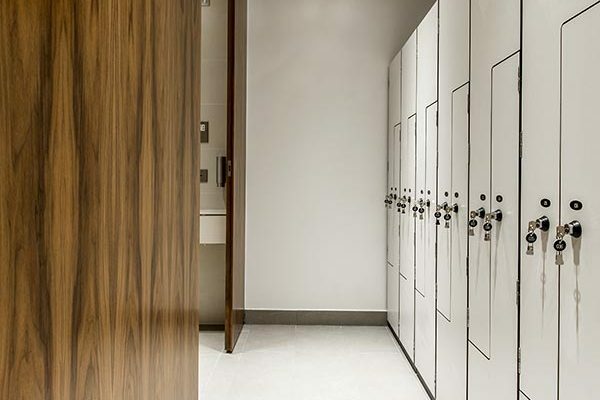 In the staff shower and changing area in the basement of the building, our solid grade laminate Forza lockers were specified to provide staff with a durable, secure storage facility.